One factor holding back a stronger rebound in home construction has been the tight availability of acquisition, development and construction (AD&C) loans. However, the stock of residential AD&C loans outstanding has been on the rise, posting a 16% gain since the second quarter of 2013. According to data from the FDIC and NAHB analysis, the outstanding stock of 1-4 unit residential AD&C loans made by FDIC-insured institutions rose by $2.478 billion during the second quarter of 2014, a quarterly increase of 5.41%. This was the largest quarterly increase in loans outstanding by both dollar volume and percentage change since the end of the Great Recession. The second quarter expansion marked the fifth consecutive quarter of increase. Since the first quarter 2013, the stock of outstanding home building AD&C loans has grown by 18.6%, an increase of approximately $7 billion. However, lending remains much reduced from years past. The current stock of existing residential AD&C loans (the blue area on the graph above) of $48.2 billion now stands 76.3% lower (denoted by the red line) than the peak level of AD&C lending of $203.8 billion reached during the first quarter of 2008. The FDIC data reveal that the total decline from peak lending for home building AD&C loans continues to exceed that of other AD&C loans (nonresidential, land development, and multifamily). 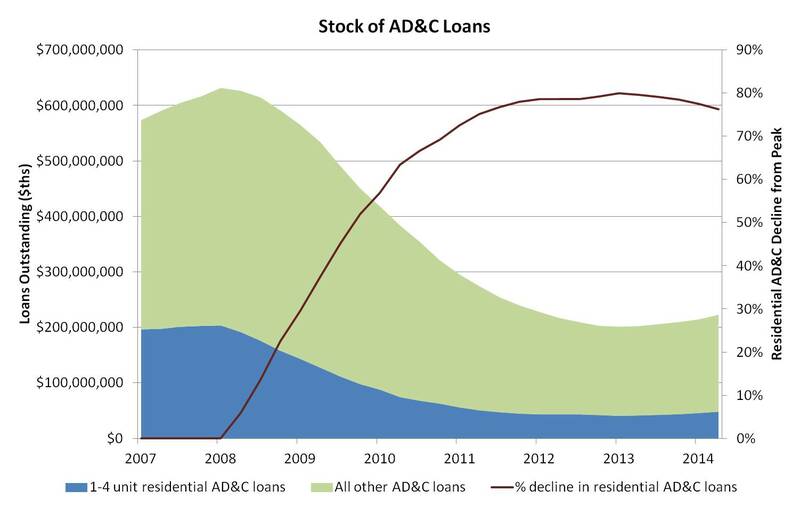 Such forms of AD&C lending are off a smaller 60.1% from peak lending. This class of AD&C loans has now registered five quarters of significant increases (3.6% for the second quarter of 2014).